Keep plugging away. Stay sharp. Be prepared. That’s the motto of a backup goalie. Even with Martin Brodeur gone, it can’t be easy for a New Jersey Devils backup to stay fresh. However, lo and behold, Keith Kinkaid is doing just that and more this season between the pipes for the Devils. Back in training camp, the Farmingville, NY-native battled Scott Wedgewood and fended off trade rumors to retain his place on the New Jersey roster. In his third year playing behind Cory Schneider, the “Blockaid” is making the Devils brass look smart. Signed as an undrafted free agent out of Union College in 2011, Kinkaid has displayed flashes of brilliance during his Devils tenure. In 2013, he made a memorable highlight reel save on Steven Stamkos. Playing 19 contests in 2014-15, Kinkaid posted a solid 2.59 goals-against average and a .915 save percentage. Last season saw the former Dutchmen netminder log a .904 save percentage and a pair of shutouts, including one against the eventual Western Conference champion San Jose Sharks. 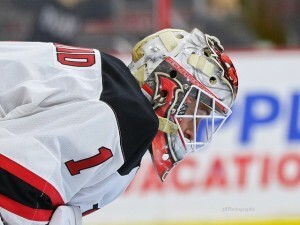 This season, Kinkaid appears up to the task of playing a part in the Devils’ success. In his sparse opportunities, he has impressed. Through three starts, Kinkaid is 2-0-1, with a microscopic 1.66 goals against average and a .944 save percentage. Like Schneider, Kinkaid’s play has not dropped off. Additionally, he is receiving about the same amount of support as Schneider but he hasn’t let it affect him. New Jersey has scored eight goals across Kinkaid’s three starts. In two of the three outings, the Devils’ backup carried the club into the extra session, helping them recoup at least one point. Two of Kinkaid’s three starts have come away from Prudential Center. Judging from each start, it’s no surprise that he has both of New Jersey’s road victories on the young season. Registering their first road victory at Carolina, Kinkaid improved to 4-1 in his career against the Hurricanes. While a Michael Cammalleri hat trick was helpful, the goalie’s 33 stops and near shutout, earned him second-star honors in a 4-1 Devils win. At Buffalo, with not much offense to work with, Kinkaid helped guide the Devils to victory. In a 2-1 overtime win against the Sabres, punctuated by an Andy Greene penalty shot winner, he took home second-star honors again with 25 saves. Among the more impressive Devils backup netminders of recent vintage is Johan Hedberg. 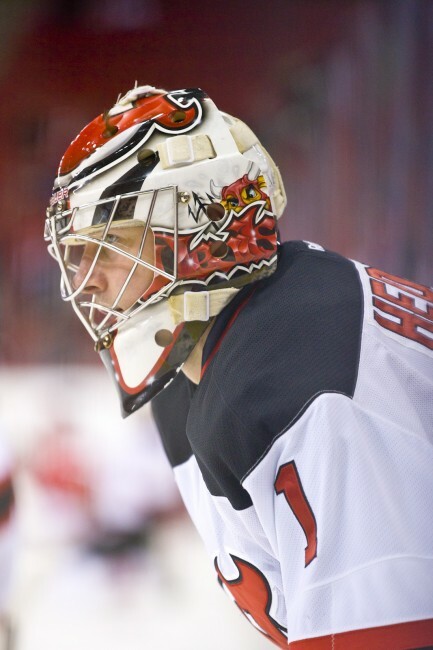 When the Devils last reached the Stanley Cup playoffs in 2011-12, Hedberg played an integral role behind Brodeur. On the Eastern Conference championship squad, “Moose” made 27 appearances and 23 starts, winning 17 games. Going deeper, Hedberg outdid Brodeur with four shutouts, a 2.23 goals-against average, .918 save percentage and a .522 quality start percentage. Given Kinkaid’s play and the Devils’ schedule, which features 13 back-to-back games, New Jersey could ride his success and that formula to a winning campaign.